Bloomfield Collegiate 'Rag Dogs' are Top Dog! 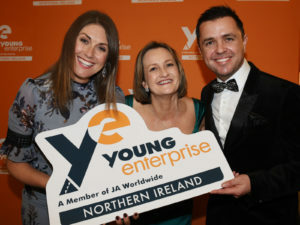 | Young Enterprise N.I. Home » Our News » Bloomfield Collegiate ‘Rag Dogs’ are Top Dog! 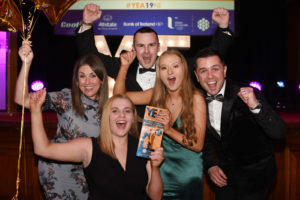 The Young Enterprise company ‘Rag Dogs’ from Bloomfield Collegiate has been named Young Enterprise Company of the Year at this year’s prestigious event at Belfast City Hall. ‘Form a Flame’ from Lurgan College were runners up. 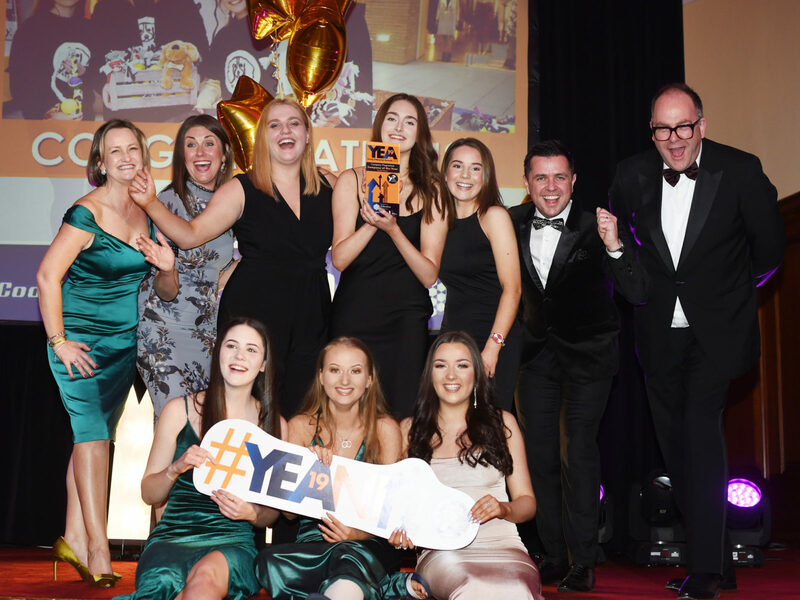 The students finished off an exciting year exploring entrepreneurship and developing their business skills with the top award of the night. Winning over the judging panel with their unique, handmade dog toys, made entirely from recycled materials, Rag Dogs was one of 8 finalists out of almost 100 company competitors from across NI, all in the running to become the Young Enterprise Best Overall Company. 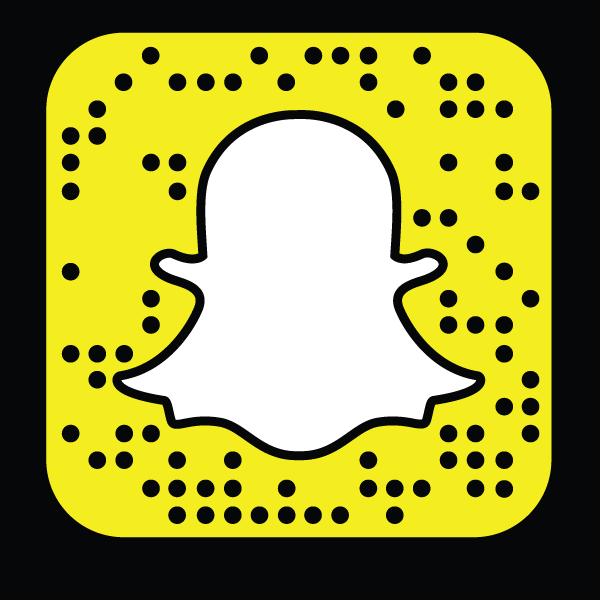 The process involved a daunting pitch and interview at Invest NI Headquarters in Belfast, where the entrepreneurs faced a panel of some of Northern Ireland’s top business moguls. The judges were impressed by the winning team’s passion for creating a strong brand that is both rich in quality but also fulfils a role in helping to protect the planet. With 1 million tons of clothes being discarded in 2016 alone, the team’s sustainable and eco-friendly brand offers products that are 100% recycled, made completely from donated materials from Oxfam that would otherwise be sent to landfill or incineration. Animal Welfare charity Assisi has offered to sell Rag Dogs products in their charity shops across Northern Ireland. Rag Dogs will be donating 10% of their final profit to Assisi in gratitude for all of their help and guidance. Rag Dogs will represent Northern Ireland at the National Finals in the UK this June. 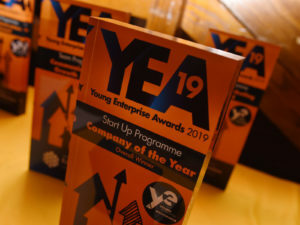 The Young Enterprise Company Programme runs every year in schools across Northern Ireland, allowing students to develop their entrepreneurial skills whilst connecting with local businesses. If you would like to find out more about supporting or volunteering with Young Enterprise contact info@yeni.co.uk or 028 9032 7003. Post Title: Bloomfield Collegiate ‘Rag Dogs’ are Top Dog!